Reference number for this case: 18-Oct-54-Luçon. Thank you for including this reference number in any correspondence with me regarding this case. "Finally, in Luçon, Mr. Boulineau observed a large luminous ball with a crescent-shaped portion that was red in color. The ball moved rapidly, turning on itself and disappearing in a few seconds." The author indicates that on October 18, 1954, in Luçon in the Vendée, "one does not know what they saw." He indicates that only Paris-Presse for October 20 mentions this case without giving even one detail, that it is impossible to go up to the source and not even possible to check the date. Another of these observation which is likely well to remain in the cellars of amnesia occurred in Luçon on October 18, 1954. Aimé Michel quotes this case in Mystérieux Objets Célestes, specifying that the source of information, the newspaper Paris-Presse for October 20, 1954, does not give any detail. Unable yet to consult this journalistic source I can only report on the existence of this observation, expecting to discover the exact content of it someday. In Luçon (the Vendée), ufo sighting. The sources are indicated as "Paris-Presse, 20 octobre 1954" selon "Michel, A.: Mystérieux Objets Célestes, 1958" selon "Choloux, Jérôme: "2. La vague de 1954" in "Les OVNIs en Vendée", Les Mystères de Vendée, 2007. As the date is uncertain and the time is unknown, it is not possible to say whether the moon was a possibility. There is also the balloon, and of course, that of an extraterrestrial craft. 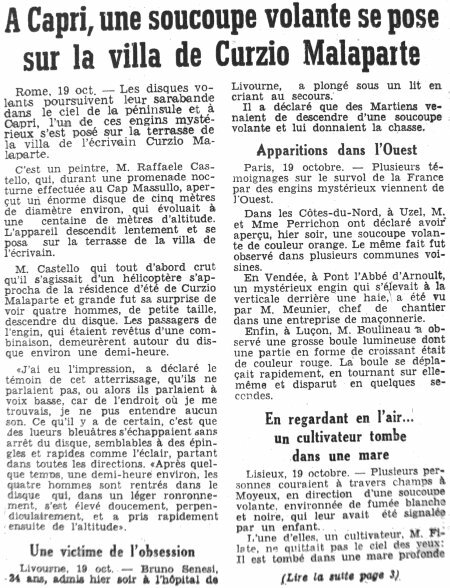 [---] Article in the national newspaper Paris-Presse, October 20, 1954. 1.0 Patrick Gross June 6, 2009 Conversion from HTML to XHTML Strict. First formal version. Additions [am1], [jb1]. 1.2 Patrick Gross June 8, 2010 Addition [la1]. 1.3 Patrick Gross March 4, 2017 Addition [ub1]. 1.4 Patrick Gross January 20, 2019 Addition of the Summary. Explanations changed, were "Not looked for yet."